3-in-1 Car Parking Assistant: Parking Ultrasonic Sensor + Rear-View Camera + 4.3" TFT LCD Di..
BSD Blind Area Monitoring Assistanc..
BSD Blind Area Monitoring Assistance System 20m Maximum Detection Range Features: ..
Digital Display Q8 Bluetooth Hands-..
Digital Display Q8 Bluetooth Hands-free Car Kit FM Transmitter 2.5A Car Charger Support Aux-in TF.. Car License Plate Frame Rear-View C.. Car License Plate Frame Rear-View Camera IP68 Waterproof Camera of 170° Wide View Angle with .. Car Assistant Parking Sensor System.. Car Assistant Parking Sensor System with 4 Grey Ultrasonic Sensors of Detection Range 30-200cm ..
C6 Pair H11 LED Headlight Waterproof IP68 72W 7600LM Xenon White with 2-Way Cooling Design Fe..
Vgate iCar 2 Bluetooth/WiFi OBD II Car Diagnostics Scanner Compatible with Android - White ..
C6 Pair 9005 LED Headlight Waterpro..
C6 Pair 9005 LED Headlight Waterproof IP68 72W 7600LM Xenon White with 2-Way Cooling Design F.. Reversing Parking System with 4 Ult.. Reversing Parking System with 4 Ultrasonic Sensors of Detection Distance 0.3-2m and LED Display .. 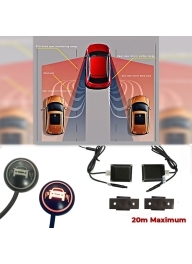 Car Assistant Parking Sensor System LED Display Monitor with 4 White Ultrasonic Sensors of Detect.. Car Wheel Repair Wrench Set.. Car Wheel Repair Wrench Set Features : This Grip is a universal socket that in..